Anne Shirley. Anne-with-an-E. She will always be the heroine of my childhood. And, the more I think about it, of my grown self as well. Last week we talked about using the Facebook 10 album challenge as a writing prompt. Thinking through the most formative music of your life and sharing it, incrementally, with an element of personal narrative can serve as a great exercise in spiritual formation. Obviously, now we have to do the same thing with books. As I think through my 10 most formative books, they are not necessarily my favorites. Some are actually books I hated, but that challenged me in some way. 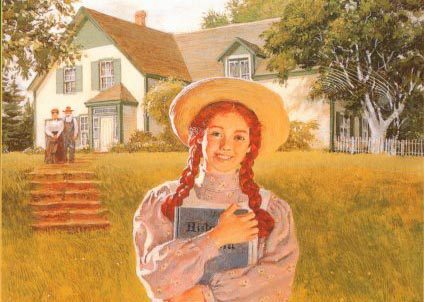 But first in my heart, always, is Anne of Green Gables. I remember reading most of it the summer I was 10, sitting on the back patio hiding from my then-2-year-old brother. It was the summer I learned the joy of snacking and reading at the same time. I think there is more than one ice cream stain on my well-worn copy. But of course, my real love was Anne herself. Anne who talked too much; used too-big words; was constantly writing stories when she was supposed to be doing other things; and had a wild imagination that could not be contained by the geographical boundaries of Prince Edward Island. I was totally that kid. And while I had a couple of frisbee-playing and bike-riding friends in the neighborhood (hi, Jason!) I didn’t really have many friend friends at that point in my life … as in, people who got me. People who could listen to my endless rambling daydreams without rolling their eyes.